This blog has proved to be a great source of accountability, for both my wife and me. There is something about laying it all out in the public (or “on the line” ) that creates a sense of duty and motivation to deliver positive financial results. Even my wife, who is only a passive reader of the blog, told me the other day that she thinks twice about spending money because she wants me to be able to publish financial reports that prove that we practice what I preach. Isn’t that cool that Mrs. GYFG is thinking about our community? She realizes the importance of the platform we are building together. Although she doesn’t write for the blog (one day I hope to convince her to do so since she is wicked smart and has her own perspectives on things), she has an active role in the story we are creating and sharing in this awesome little space we’ve carved out on the internet. Most of all, she realizes that we have a responsibility and moral obligation to set a good example for all you faithful readers. It has us both super conscious of our money, which I think is the only place to be when building wealth (and especially when blogging about it). Although I haven’t talked about it much on the blog, there is another dynamic that I have to consider when putting together all the financial details and goals I publish on the blog. That’s the dynamic between my wife and me. It is super important that if you’re married you’re on the same page as your spouse, especially when it comes to money (#1 cause of divorce, or so I’ve read). Mrs. GYFG and I have had a lot of conversations about money since I started the blog. In the early days they didn’t always end well, because I couldn’t really communicate what it was we needed to do in order to reach our financial goals. I was getting frustrated because I thought we could be spending less money, and she was getting frustrated because I couldn’t give her a simple rule to govern our financial lives. The best I could do was tell her that we needed to save as much as we could (what does that even mean?). Because I lacked the ability to really articulate what that meant, it was misunderstood as me saying we couldn’t spend any money. I admit that the first couple of months that I published the financial reports on the blog, it created a bit of tension. Not because I was putting our financial life out in the open, but because no matter what the results, to me they were never good enough. I started to be consumed with a scarcity mindset when it came to spending, when in reality, I have always operated with one of abundance. I never intended for this to be a blog about frugality and clearly, it’s not. I even stated this in one of my earlier posts about how there was a limit to how much you could cut expenses, but no limit on the amount of income you could earn. I clearly addressed that keeping expenses low was important, but it was figuring out ways to increase your income that deserved most of your mental energy (see my post on relative frugality). I would slip in and out of that scarcity mindset until finally, I realized that something had to change. Being expense-focused didn’t fit my personality and was in direct conflict with my operating system. It is way more fun to figure out how to make more money to pay for things than to cut expenses to the bone. Something had to change for my own sanity and to get my wife and me onto the same page financially. I was determined to find a simple rule that would allow me to maintain a state of abundance, while at the same time coming up with something that would ensure that we stayed on track to reach our financial goals. If this rule were to be effective it could not be so restrictive that we would hate life. To be honest, we enjoy spending money on things that bring us joy. Anyone that has been reading this blog for any length of time should know by now that I’m not a huge fan of delaying all gratification for “someday.” It’s prudent to plan for the future, but since no one is promised a tomorrow, I think that you have to figure out a way to both enjoy the present and prepare for the future at the same time. Thus a balanced approach was born. After realizing that we were traveling two paths at once, it hit me that the two paths should get a 50/50 split. That’s only fair, right? Our present selves would get to enjoy 50% of our after-tax income. And our future selves would thank us for saving the remaining 50% for the future. That is where saving 50% of our after-tax income came from. Note: We include the expense of healthcare insurance for medical, dental, and vision as a tax. So these expenses come out along with income taxes before we calculate our savings rate. This rule works very well for the GYFG household. I know most bloggers are against any sort of lifestyle inflation, but I like that this rule allows for a proportional amount of lifestyle inflation. That’s not to say that as our income grows that we will always spend the full 50%. I actually envision an inflection point where our spending will not be able to keep pace with the growth in our income. Our Mortgage – We are currently executing our plan to have our 30 year mortgage paid off in 7 years and 3 months (before we are 35). Based on our current spending in 2015, this would cut our spending by $2,400/month (combination of the regular mortgage payment and an additional $800/month in principal reduction). Home improvement projects – Our list is getting smaller. We have averaged about $2,000/month for the first 20 months of home ownership. Yep, we have spent about $40K on projects since buying the home in February of 2014. Since we didn’t develop this goal until late in the 2nd quarter of 2015 we will likely not hit the 50% savings mark for the year. I have created a forecast in order to allow us better visibility and accountability in achieving this goal going forward. Before this post, we were just kind of winging it. Note: Our current savings rate on a year to date basis through July is 42%. Our plan is to pick up the pace through the end of the year in order to hit our 50% target. More details to come in the near future, with all the numbers that go into the calculation. While we are on the topic of savings rate, it is probably a good time for me to define my definition of how I calculate savings, and thus savings rate. Note: Taxes in the equation above includes expenses for health, dental, and vision insurance. Amortization represents the amount of principal reduction from paying down a mortgage as this is just a balance sheet transfer (your mortgage payment would have been picked up in your living expenses, so we are just backing out the amortization piece). You may be asking yourself why we chose to have our savings rate govern our financials. It’s actually a rather simple answer: it’s really the one variable that we have the most control over. Do you have any rules that govern your finances? Can you distill it down to just one? Do you think I am totally crazy? What would you do differently? Any and all thoughts are welcome in the comment section below. Since I started following the FIRE community on the internet and even more after I started blogging, it became simpler to discuss money with my wife. Before we had amount based discussion on what to do with this or that cash or expenses. Nowadays, we more discuss the bigger picture and the end goal. This is by far a more fun discussion. For now, we live by a simple rule: we each have our fun money, on our own account. No questions asked on what we do with it. We can spend it all, roll it over to the next month, whatever… This works fine for us. All other money is sent to a dedicated account, either investing or saving for yearly recurring or upcoming big expenses. Glad you have gotten to a point where conversations around money are fun to have with your wife. Also glad you have found an operating system that allows you to enjoy life while working to achieve your financial goals. Hey GYFG – that’s great that your wife is totally onboard with the plan, it makes your couple and your finances stronger. We also track our finances based on the Savings Rate and we recently added a “% to Financial Independence” reviewed each month. This percentage increases as income increases or spend decreases, it goes both ways. The Savings Rate is our monthly KPI and the “% to FI” is our ultimate long term trend progression. I could not agree with your more MoneyMine. A couple that is on the same page financially is a stronger couple indeed. % to FI is an interesting metric to consider. What kind of fluctuations do you see on a monthly basis on the “% to FI”? This year, we expect it to increase a little over 1% per month. Because our Savings Rate, or income, or spend tend to fluctuate over the months, it can be difficult for us to see how much progress we actually make because every month carries a different weight. Measuring % of FI achieved is one way for us to keep things in perspective, in addition to boosting our motivation. As there are a lot of variables in the equation, this somehow shows how we progress over time. Thanks for the extra information MoneyMine. That’s an awesome goal!!! My current rules are more lenient and are just – don’t spend when I don’t need to, and save everything else. 🙂 Maybe I should batten down the hatches some more. But I’m hitting my goals, so I haven’t found the need to increase my personal finance workload. 1 – It was a great and simple way for my wife and I to get on the same page financially. Not sure I would need it if it was just me. 2 – I also wanted a framework in place that would ensure that I didn’t sand bag my goals. Perfect example was the recent pay increase that I got. 3 – I love things to measure. I am addicted to data. I also love to see progress. This blog is not about being frugal? I think setting a goal and tracking the progress is a great way to maintain visibility of what you want to achieve.I have allowed for a small bit of increased expenses when I get raises, but not a percentage. It was probably more like 15% of my last raise, but may be more next time around. Hey Vawt – I know I constantly feel the need to remind readers that this is not a blog about being frugal. When I look at our spending every month, I definitely don’t feel frugal. Yet, when I look at our savings rate I realize that the definition of frugal is relative to income. Our savings rate would indicate more frugality than spending alone. Like you, we have built capacity for lifestyle inflation. However, I am pretty sure that we will not always spend our full potential. Dear Mr. & Mrs. GYFG, this looks like a great plan as well as excellent execution. Getting up those first rungs of the savings-ladder are the toughest ones. And a problem shared, is a problem halved. For myself and Mrs. Ceezy, we backed into our percentages, which were roughly 40% savings, 30% taxes, 30% living expenses. Some years were different (car purchase, home repair/improvement/travel), and we didn’t sweat it. I have always sort of lived like a college-student, and for a long time it wasn’t a choice. That lack of options led me to super-save, to get those options and be a Freedom Fighter. One point that you have made very well in past posts, GYFG, is that the PF is something you can control. Investment returns, market cycles, etc. are fun to predict, but are subject to a lot of variables. And especially in the front-end of the ramp to FI/RE, savings is going to be the biggest part of the Net Worth increase. As I mentioned before, over 30 years of working and saving our split for Investment Return/Savings was 52%/48%. It takes a long time before reaching a ‘Critical Mass’ where the NW can throw off enough money to be significant. One more resource, for those interested…there is a great book called “The Tax Racket” by Martin Gross (Link to Amazon). In the back of the book, there is an extensive worksheet to calculate the amount of taxes you really pay (property taxes, vehicle, gasoline, sales, travel, not to mention income) and very few people have any idea what they truly pay. Take a guess, and then calculate it; for a two-income couple, the reality will be much greater than the predicted estimate. My last thought on your aggressive strategy is that you are mitigating future risk, in a big way. Not sure what your plans are (and not asking! it is your business!) but if a child gets into the mix, a health problem, a job loss, lawsuit, etc. there is no way to recover that time/savings period where your resources have to go elsewhere. Job loss, in particular, is problematic. Where you live in S. Cal, you must have seen quite a bit of the DINKs, stretching for house-poor status, and then losing it all. And, as you noted early in your post, financial stress is the #1 cause of divorce; most marriages (and friendships, family, business ties) won’t endure the ultimate stress, and therefore it is much better if they are never tested. Not a negative comment on relationships, but a positive compliment on your forward-thinking actions to remove potential stressors. Great post, thanks for taking us along on the ride! Hey JayCeezy – First off, I just added that book to my Amazon wish list. You bring that recommendation at a good time. I have a post idea on the list to go through the very exercise you said is on the worksheet. Your split of 40/30/30 is probably pretty close to what we are targeting on a completely gross basis. 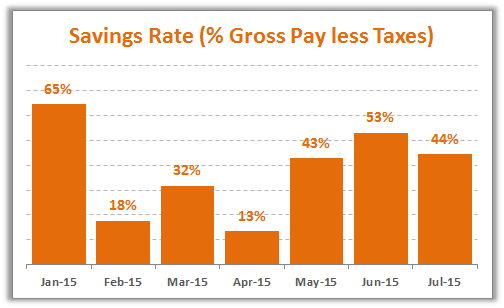 I mentioned in the post that our YTD savings rate is 42%, but that is based on a gross adjusted for taxes. I don’t call it net take home pay because there are other things being deducted from it. But if you account for a 30% effective tax rate and factor in different deduction like interest on the mortgage, pre-tax savings, and benefits that are pre-tax, then I would guess we are pretty close to the 40% savings rate on a real gross basis. At the end of the day all an investor is, is a risk manager. We can only control the risk we take, not the reward we receive for taking those risks. I absolutely realize that without taking risk, there is almost zero chance that I will reach my goal of $10M, so therefore it is important that we set ourselves up in a way that we can afford to take such risks. As always, I love what you add to the conversation. Maybe you don’t have these or you ignore them, but a big wrinkle can be 401k matches and stock plans with your company. My goal is also 50% and has been for a while. Depending on if I count those are not determines if we hit the 50% mark. Hey Adam – I do have an employee 401K match, but I don’t include it in my savings number. And currently I am working with a private company that does not have an employee stock program. Next January I am supposed to start getting some options in the company, so that could potentially lead to a nice windfall in a liquidity event. But I will likely not include those in my savings rate either. The 401K match does however get picked up in my net worth calculation at the time it actually hits the account. I think of the match as more of a return on my savings and not necessarily savings itself. This is the same rule that me and the wife have. Like you, I used to also think that we should save as much as we can but that is setting the stage for failure because it is a goal/rule that is not objective and measurable. We are trying to hit the 50% mark too but have faced setbacks recently due to my work situation. But that should change soon. Yes, save as much as you can is really a meaningless goal. If you can’t measure it, then it is garbage. Hope the work thing is going well. I love the simplicity of this. We’re still in the “save as much as we can” mode, but you’re right in saying “What does that even mean? !” This is great motivation to figure out a simple one-line solution to what our financial goal is. Thanks! Hey Maggie – You might had seen a weird response earlier when I responded to the wrong comment earlier if you are subscribed to the comments. If not, never mind. Anyways, come back and share your one-line solution when you figure it out. Hey Sylvia – Glad you like the simplicity. The good news is that you and your Fiancé are both wired to be savers. The way I look at it, you guys are at least reading from the same book. It took a few years into our marriage before we landed on the exact same page. I literally was just explaining this to my girl last night. Great post GenY. I think it only makes sense, of the money you make – aim to save 50% after tax and spend 50%. I think if people do that they would be ahead of like 95% of folks from the U.S. Also, you like in SoCal? Damn that must be expensive. CA Taxes are insane! Glad you enjoyed it Steve! Peter @ How To Live In The U.S. I try to live by this rule every day. Although, I sometimes vary between 30 – 50%. I have found it to be the most effective way of saving a lot of money fast. There was a point when I was only saving about 10% of my gross income, which I though at the time was one of my greatest accomplishments ever. Especially since no one in my personal environment was anything. Now I realize I should’ve pushed it even more. I’m glad I reached a point in life where I consider saving 30-50% of my gross income to be normal. It’s so satisfying seeing my savings account grow. Thank you for the post and feel free to check out my blog! Hey Peter – Thanks for stopping by! We definitely didn’t start out saving 50%, and really only recently worked our way up to this savings rate. But, you are right. It is definitely the fastest way to build your savings quickly. This year we are forecasted to actually come in at 46% vs. our goal. But next year we will improve. People forget how powerful a high savings rate can be when building wealth. I will check out your blog. Really well thought out plan and subsequent post on how you achieve the goals of the savings plan. I was able to relate to the financial discussions with your wife, and the blogging about it all. Mrs. SPF did write early on but not as much after our children were born. One thing I do like about your site is that you are taking control of your personal finances early. Wish I had. Good work to you both! When you start young time is definitely on your side. Quick one. Does the extra amount you are paying on your mortgage sit in the living expenses side or savings side? The the only piece of any mortgage payments I make (regular or extra) that sit in the expenses is the interest. The amount that pays down the principal is part of savings because it is just a balance sheet transfer from cash to another equity.